I had the awesome pleasure of being on the Robert Plank Show to discuss my new book: How To Sell My Own Business. Robert Plank: Today's guest is David Barnett. He's the author of How to Sell My Own Business, a Guide to Selling Your Own Business Privately and Not Pay a Broker's Commission. David, welcome to the show. David Barnett: Thanks, Robert, for having me. It's great to be on with you today. Robert Plank: I'm happy to be talking to you. 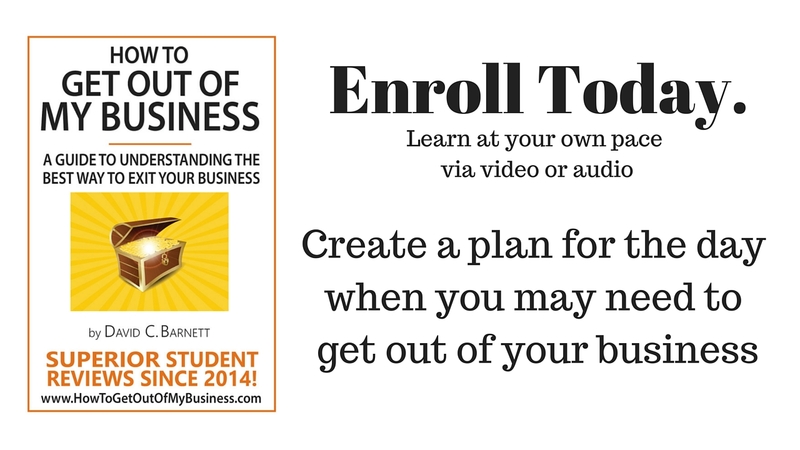 How to sell your own business, how do you do it? 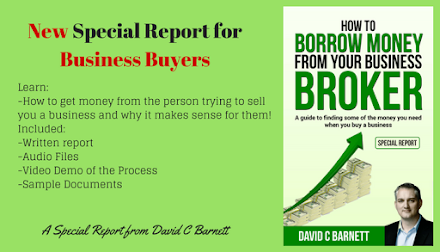 David Barnett: The book comes about because of my experience as a business broker. I spent 4 years working full time as a business broker helping people sell businesses and acting as an intermediary. I learned a lot along the way. 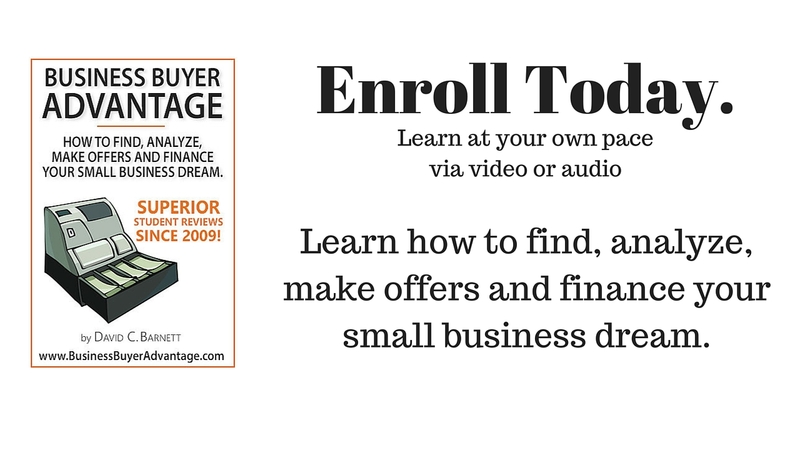 1 of the things, of course, that I learned is the majority of business owners would like to sell their business 1 day, but don't want to pay the huge fee associated with using a qualified business broker. When I left that industry, for a couple of reasons, I started thinking about my time as a broker. I realized, "You know what? There's a market and an opportunity to help people do this themselves without using a broker, which is what the majority of business owners want to do anyway." Robert Plank: That makes a lot of sense. Is it true? Somewhere I've heard some kind of statistic that 95% of the wealth is created by someone selling a business? Is that right? David Barnett: I'm not sure about that, but I know that over 80% of businesses that change hands do so privately, without the use of a broker. People are out there doing these deals anyway. What I kept coming across, as a broker and then later just working as a consultant helping people buy and sell businesses on their own, is that there's a lot of bad advice out there and a lot of people out there who don't quite know what they're doing. 1 of the things that I used to say to people when I was a broker is, "Hey, I'm an expert. I can help you do this successfully." because it is a complex operation. In my book, How to Sell My Own Business, I don't tell you everything you need to know to sell your own business. I tell you the process and I tell you what specific things that brokers normally do that the business owner does need professional advice to get done. You can get those things done on a fee-based service. What most brokers do is they'll say, "Look, I'll sell your business for you and I'll package it up and present it to buyers and I'm going to charge you 10 or 12% of whatever we end up getting for you." You can get those expert tasks done sometimes for a couple thousand dollars each. If you're willing to pay as you go through the process and hire experts like you would hire a lawyer, or an accountant, you can end up at the end of the day pocketing all the proceeds of the sale and just having some expenses along the way as long as you know the process and you know how to get from start to finish. Robert Plank: Instead of having someone do an all in 1 deal for you, you might have to do a little bit of hands on stuff yourself, a little bit of managing, but that way you just pay a flat fee instead of this percentage of what could be a huge amount of money. David Barnett: Yeah. When I was a broker, I sold a couple million dollar businesses and had to present people with some commission invoices for, in 1 case, it was $98,000. That's a really big pill to swallow. Robert Plank: Yeah, times 12%. David Barnett: Yeah, my bill was $98,000. Why did I have to charge that kind of money when I was dealing with these people? It's quite simple. As a broker, I'm taking on all different listings. Not all of them will sell. All of them require my time. If I'm going to work full time and have 10 or 12 businesses that I'm trying to sell at any given time, over the course of the year, if I only sell 3 of them, I've got to charge those 3 sellers enough money to cover all of my time for my entire portfolio of companies. Quite literally, what is happening, Robert, is the people who have good, profitable businesses that are what we would call "winners" have to actually subsidize the effort that goes into trying to sell losers. Robert Plank: It almost sounds like you're being an actor. It's like do all these projects, not get paid, do all these basically auditions, or put in all this work and then 1 or 2 might pay off as a big payday. It sounds like what you prefer is to do things on a fee-based basis. That way you can have more of a predictable income. 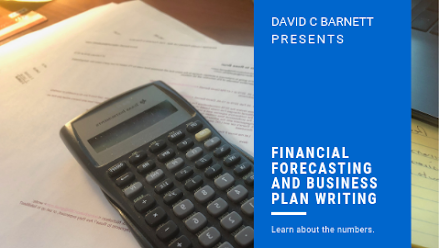 David Barnett: From my own point of view, now that I'm no longer a broker, now that I am a fee-based service provider, what it means is that if I work with 6 different clients over the course of a month, at the end of the month, I'm issuing 6 different bills. Each person is now just paying me for what I do for them. I'm not giving anybody any $100,000 invoices. I'm charging people a couple grand for the different things they might have me do. Let me give you an example. In my book, I explain why pricing is so important and the dangers of over-pricing, or under-pricing your business. Many people will look at selling their business. They'll say, "Look, I'll put an asking price on it and if I can't get that amount, then eventually I'll come down." The danger with that strategy is that if you overprice a business, you will actually scare away what I call the reasonable buyers, the people that actually have an idea of what your business should be worth. If they see that you're asking double what it's worth, they're just going to assume that you're a nut. They know that dealing with you is going to be a waste of their time. You're going to scare those people off. The people who actually have money, are financiable, have a good banking relationship, and a good credit score, who are qualified to run your business are going to be scared off. They think that you're unreasonable. The people who won't be scared off, though, Robert, are the low-ballers, the guys who are going to offer half price on anything. What ends up happening is if you don't price the business right, you chase off those good characters, the people who might actually be legitimate buyers and you're left dealing with those other clowns who are going to try to get the lowest possible price. You don't know if they're going to be qualified at the bank. If you end up financing part of the transaction, you don't know if they're qualified to run the business, it's a bad story all around. 1 of the things that I do, for example, with my clients today is I do the evaluation and show them what their business will sell for based on what other similar businesses have sold for in their industries with the same sales level and cash flow so that they go into it with a realistic understanding of what the business is worth. Then I help them set the price. I also do what's called the packaging, which is to create the buyer facing documents so that they can make a creditable presentation to buyers when they come along. That's another big mistake that a lot business owners make. They'll start sending out feelers within their network indicating that maybe they're interested in selling their business. They get someone in front of them who wants to buy. Then they're not ready to share their story. They don't have their financials prepared. They don't have a package of information to share. They make this person wait, and wait, and wait. What ends up happening, like in any sales situation, is if you're not ready to act when the iron is hot, people cool off. That hot prospect then starts to look at other things. You lose their attention. There is a whole process here that people have to be prepared for before they meet that potential buyer. Robert Plank: I like that and I like how it sounds like the advice you've given, the steps you take people through, it's a blend between you feeling out the company, and making judgement calls here and there. It sounds like a lot of it is backed by the data. It sounds like 1 possibility for someone is, like you said, go to that person that charges 10 or 12%, but that doesn't sound like a very good solution. It sounds like the second possibility is for someone to try to do that themselves, but then it sounds like from the things you've listed there's all kinds of mine fields and all kinds of mistakes they could make. It sounds like you're the best blend of the 2 where you don't take this huge cut, but then you also do all the things that make sense that's in their best interest. David Barnett: I'm obviously trying to position myself to be attractive to what I know is a big market, because I've got customers ever day. For some people, it's not for them. My book, though, is still for them. If you think, "This is a complex process. I think I'd like to hire a broker anyway." the first half of the book actually talks about why you would want to use a broker and how to identify a good one versus the people who are pretending to be business brokers. There are a lot of intermediary types out there who will tell you that they can sell your business, but they don't actually know what they're doing. In my opinion, that's the worst possible place that you can end up being. I use all kinds of examples in my book of people that I've run across over my years in the business who thought that they were represented by a business broker who were actually dealing with someone that had no idea what they were doing. There's an example in my book about a restaurant owner. The restaurant owner decided he wanted to sell. He hired a real estate agent to sell his restaurant. The real estate agent found 1 buyer after another. Nobody could seem to qualify for financing. The agent actually called me and asked me if I would help him send his buyers to the right place to get financing to buy this restaurant. What I said to this agent was I said, "Look, you're asking me to give you my magic jelly beans basically. This is how I make my living." I said, "Mr. Real Estate Agent, why don't you send me your client and I'll do the deal and when the deal is done, I'll give you a referral fee." He absolutely refused. He said, "No, it's my deal, mine, mine, mine, mine. I want all my commission." I said, "Great. You go figure it out." Here's the problem, Robert. Restaurants are a highly risky business category. Restaurants actually can't get financed anywhere. In almost every situation I've ever heard of if there's a restaurant that is a good, profitable business that has any amount of what we would call good will, there will be a certain amount of vendor financing involved. A buyer will come along and they'll make a down payment and maybe they can borrow at the bank if there's some equipment there, or a building, or something like that. They'll never, ever be able to put the whole price together. The seller will always be required to do what we call "holding paper", or do some vendor financing. Let's say that restaurant sold for a quarter of a million dollars. Maybe the buyer is able to put together half that money for closing day. The seller will receive payments maybe over 5, or 7 years. The problem with this situation is that neither the seller, nor the real estate agent knew that. They had probably met 3, or 4 perfectly reasonable, good, qualified buyers and they were ruining the deals for themselves because they didn't know what they were doing. That's the kind of example that I point out when I say that, "If a business seller goes to the wrong kind of intermediary, it's the worst possible case. They'll actually end up saying, "No" to reasonable deals. Robert Plank: It sounds like in cases like that where they might just take a deal out of desperation, or might be just that the process has been dragged on for so long, they'll just take anything it sounds like. David Barnett: What usually ends up happening is this. Sellers reach a certain point of motivation where they decide they want to sell their business. Once that decision has been made, there's a clock that starts to run. The seller, now, they've made the decision, "I want to sell. I want it to be gone." The enthusiasm and the energy that used to be there to go into the business starts to wane. When it starts to wane, the little things stop getting done. The polish comes off the business. You know what I'm saying? Eventually sales start to decline. With that, profitability starts to decline. If you don't sell the business quickly enough, the good will can start to erode. What happened in this particular case is something I've seen too many times. The owners actually closed the restaurant and ended up just trying to sell the building. They actually pulled the plug on all the value they had created over 20 years. Any good will that existed in that business is now gone. The business no longer functions. Now they've got something that someone can finance, which is just simply a building. They're going to end up with less money in their pocket. It was because they hired the wrong kind of person. Like I said, the first half of my book, I talk about how you identify a qualified business broker, what they should charge, what the fee structure should look like, the types of questions they should ask, how they should be coming about determining an asking price for your business. I've had a lot of feedback from people who said, "You know, I thought about doing it myself. I read your book and I realize I did want to use a broker and thanks to what I read in the book, I realized a couple people I met with probably would have been very dangerous for me to do business with." Robert Plank: That's awesome. Yeah, it sounds to me like it's the kind of situation where it's like you take your car in to a mechanic. You don't have to know every little detail about your car, but maybe you should know a handful of things. That way you don't get ripped off. David Barnett: Yeah. The most important thing you need to know is can I trust the mechanic. Robert Plank: Yeah, and are they just totally screwing up, or do they know what they're talking about? David Barnett: Yeah, yeah, exactly. Robert Plank: Cool. You listed a couple of things so far. Can we unpack a couple of mistakes you see? We could go at both ends of it. What are the mistakes you see people trying to sell their business making and the mistakes that maybe some of these brokers are making? 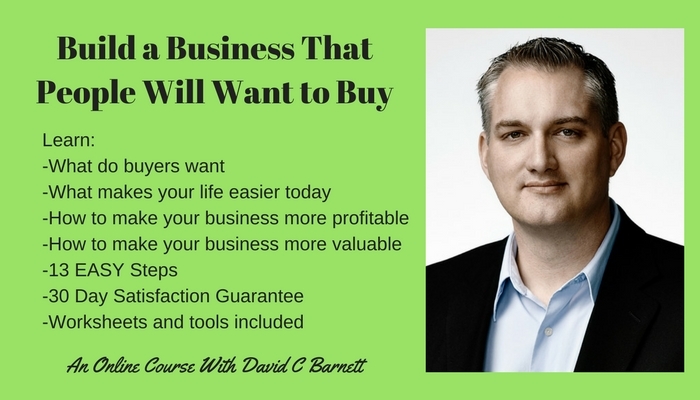 David Barnett: People who are trying to sell their business, the number 1 mistake that I see them making is that they don't actually understand what it is that they're selling. That may sound silly at first. Let me give you an example. Let's say you have a dry cleaning business. You operate out of a building that you own. You're not actually talking about a business anymore. You're talking about a 2 businesses. You're talking about a dry cleaning business and you're talking about a commercial real estate business. Just because your business happens to be the tenant of your commercial real estate business, doesn't discount the fact that there's 2 different businesses. What'll happen is people will say, "Well, I own a dry cleaning business and I want to sell it to someone." If they insist on keeping the real estate combined with that, what ends up happening is now you need a buyer with deeper pockets who not only can make a down payment on the dry cleaning business, but can also make a down payment on the commercial property. The more money a buyer needs to have, the fewer potential buyers there are. You can imagine, Robert, that out there in the world of people trying to buy a business there are obviously a lot more people with 50 grand in the bank than there are with 200,000 in the bank. If we separate those 2 things. This is 1 of the exercises I used to do with my sellers. I would say, "Look, let's look at offering the dry cleaning business for sale and you offer the building as an option to them. You say you can buy the dry cleaning business and you can buy the building if you want, but if you don't want to, I'll lease it to you on a 10 year contract with a lease." Now what we've done is we've made the business to be bought much smaller and more affordable. Now there are more potential buyers, which means we can sell it more quickly. Once we get that dry cleaning business sold and we have the lease in place, we can now sell the piece of property to anyone who wants to collect rent. It's a completely different market, Robert, to people who want to buy commercial property. What happens a lot of the time is that the seller will realize, "Hey, it takes a lot less energy to be a landlord than it does to run a dry cleaning business, so maybe I'll just keep the building for a few more years and create a passive income for myself collecting rent." What happens in a lot of cases is these buyers, after they've run the dry cleaning business for a couple years on their own, and they've got their own financial statements prepared for the time that they've owned the business, they can now go to the banker and qualify for a mortgage to buy the building. Robert Plank: That's pretty cool. Yeah, that a good strategy. David Barnett: Yeah. That's what I mean when I say that sellers don't know what they have to sell. The dry cleaner is in the business of understanding the dry cleaning business. He's not in the business of understanding how to sell businesses. A lot of these opportunities get missed because people will go out and do it on their own without any advice at all. They'll think that they need to sell everything as 1 package when in fact they don't. I've actually helped people divide up businesses that were mixed together. I had a client who had an excavating business, but he was also doing recovery and towing at the same time. He was able to maintain all of the equipment in the same garage that he had on his property. He was out in the country. It made sense for him to have these 2 lines of work. It was 2 different groups of clients. When it came time to selling, there were very few people who were looking for an excavating and recovery business. We split that business in 2. We sold the recovery business to another operator who had their own operation about 30 miles away. They were trying to grow geographically. It made good sense for them to buy that. Once he was left with purely an excavating business, he was able to find someone who wanted to get into that industry. Yeah, those are some of the common things. On my web site, there's a free download called 12 things to do before you consider selling your business where I cover the top 12 areas that I've always seen people make mistakes. Robert Plank: Great. Where can people get that? David Barnett: It's easy to remember. 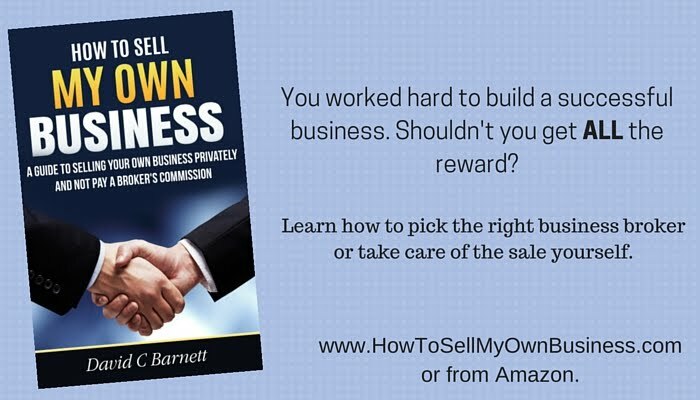 It's howtosellmyownbusiness.com which is the name of the book, How to Sell My Own Business." 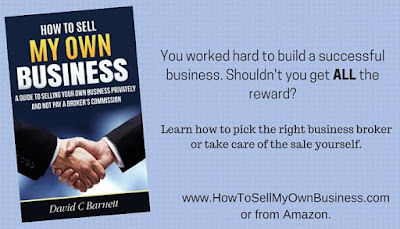 If someone wants to buy a PDF copy of the book for immediate download, they can get it at that web site, howtosellmyownbusiness.com. You can also buy the book on Amazon, either as a paperback, or for Kindle. Robert Plank: That's all great stuff. What I really like about the things that you've unpacked here today, David, is that there seems to be a lot of really cool strategies that have come about just from your years of experience and just from seeing all the different case studies. What I like the best was that last little strategy about cutting up the business and selling the parts like what Mit Romney did where you don't have to get all the way out. Selling a business might just be you sell part of the business off now and then get back in in a different way later or completely get out years from now. I really like everything that you had to say. I really like where you have your book. Just to remind the listeners 1 more time what's that URL just to make sure everyone has it? Robert Plank: Awesome. Everyone should go there and get that free report and check out the blog and get your book. They should just check out everything you have to offer. David Barnett: Yeah. People who are interested either in buying or selling businesses, if you go to that web site, you'll also see a link to my You Tube channel. There's about 200 videos now. Almost all of them are about either buying and selling small businesses, or local investing. I've got a few other books out too, Robert, that I had mentioned to you before on local investing and on franchise issues. Anything to do with buying, selling, financing, planning business is my area of expertise. Robert Plank: Cool. It sounds like a topic, an area where a lot of people, it seems like they think they know, or they think they can figure it out themselves, but I like all of the little bits and pieces and all the strategy where you've taken something complicated and made it simple and distilled it for the rest of us. Thanks a bunch, David, for being on the show. I really appreciate the advice you have to share. David Barnett: Thanks, Robert, for having me on. It's been a whole lot of fun.